The European Humanist Federation denounces and strongly opposes the proposals made by European Parliament’s Vice-President Mairead McGuinness to institutionalise further the influence of religious organisations on the European Parliament’s legislative work. This call comes after a report drafted by the Vice-President was leaked concerning the implementation of Article 17 TFEU, the article committing the EU to conduct an “open, transparent and regular” dialogue with churches, religious organisations and non-confessional/philosophical organisations. The report is to be presented to the European Parliament bureau for approval on Monday 15 April. In February, Ms. McGuiness, who is in charge of the implementation of Article 17 by the European Parliament, held a consultation to evaluate Parliament’s work in the area. 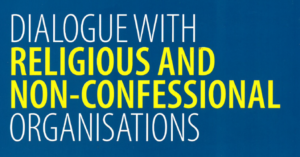 As the main non-confessional organisation in Europe, the EHF was invited to share its views in writing before taking part in a stakeholder meeting together with religious stakeholders on 19 February. The EHF is deeply concerned to see that the Vice-President’s report does not accurately reflect the debates that took place in that meeting. It rather is an endorsement of the requests made by the Catholic organisations. Beyond failing to reflect and address EHF criticism that the implementation of Article 17 has been characterized by a strong bias towards religious organisations, the report untruthfully claims that there was large consensus on a number of proposals. In fact, both the EHF and Humanists International, the two only non-confessional organisations that were present, voiced strong opposition on a number of them. This would mean that religious organisations of all kinds would have their say in potentially every issue discussed by the European Parliament, at the early stage when resolutions and report are drafted. The Article 17 secretariat would also share information with these organisations and provide them access to “legislative tracking tools”. Similarly, in a way that undermines the principle of secularism, and despite the attitude of many national political establishments to use religion as an instrument of authoritarian and illiberal policies, the Vice-President also proposed to facilitate the contribution of churches to EU legislation at national level by involving the European Parliament liaison offices as facilitators. In a context where an increasing number of religious organisations pushing an ultra-conservative agenda lobby European institutions, we can only strongly oppose this initiative to institutionalize further the influence of religious views on legislative work. , said Giulio Ercolessi, President of the European Humanist Federation, referring to a recent study conducted by Open Democracy which revealed that 50 million dollars were transferred in the last decade from US extremist religious groups to European ultra-conservative Christian and far-right activists to help them lobby against women’s sexual and reproductive rights, LGBTI’s rights and gender equality. Opening up further the EU legislative process to religious groups, inevitably including ultra-conservative ones is not an acceptable move. At various occasions, the European Parliament raised its voice to protect the very rights these groups endanger, encouraging Member States and the Commission to build a safer society for women, LGBTI people and other minorities. We cannot accept that the European Parliament now considers going backward by rolling out the red carpet to religious groups and their views questioning rights that society has fought so hard to secure. The EHF urges the Bureau of the European Parliament to reject this report and calls on the Parliament to set clear guidelines to achieve a balanced implementation of Article 17, including transparency with regards to the criteria used to decide what organisations are invited to participate and how their contributions are taken into account.